What do you do first when you go out? Probably many would check the weather to see if it will rain. But in South Korea, people check something else – the concentration of fine particles (also known as fine dust). Many Koreans have special apps on their smartphones to receive real-time fine dust information. When air pollution is too high, not only children and elderly people, but everybody is advised to stay indoors. This is not the only thing that fine dust has changed in South Koreans’ daily life. Air cleaner machines are an essential home appliance, particularly in households with children. Opening windows does not mean getting fresh air in – it’s the opposite! On the streets of Seoul, you can see many people walking with facial masks on. If you don’t like wearing such a mask because it doesn’t look cool, don’t worry. Masks with various colors and designs are available for every style, and many pop stars use facial masks as a fashion accessory. Fine dust consists of sulfur, nitrogen oxides, carbon, soot, and more. The diameter of fine particles (PM10) is less than one fifth of that of a human hair. Ultrafine particles (PM2.5) are even smaller- the diameter of one ultrafine particle is 1/20 of a human hair’s diameter. Therefore, we inhale the particles without noticing, causing serious health risks such as heart and respiratory disease or cancer. South Korea has one of the highest exposures to ultrafine particles in the world (out of 178 countries surveyed, it ranks 173rd for air quality). It is no wonder that fine dust is the number one source of concern for Koreans, more than nuclear weapons in North Korea, according to a poll conducted last year. 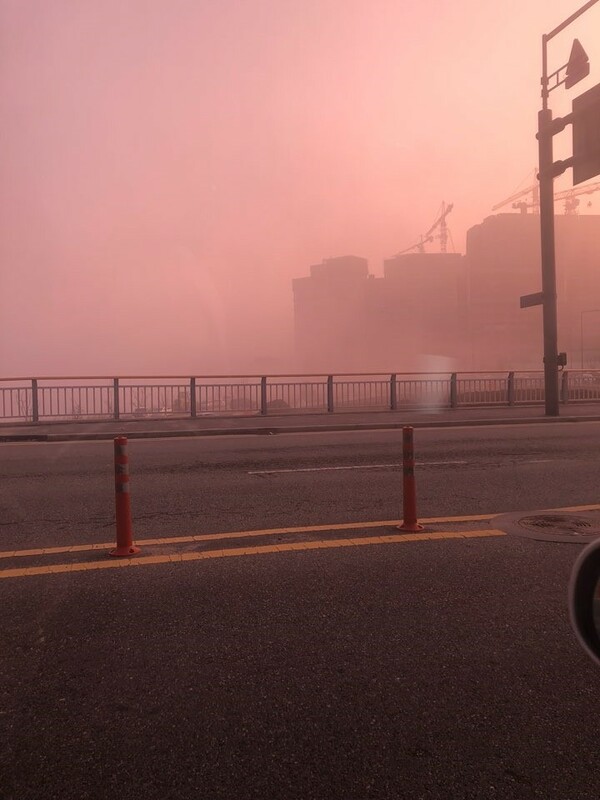 The Korean government has announced a plan to reduce ultrafine dust by 30% by 2022, but fine dust concentration in Seoul is ever increasing due to internal and external causes. Typically, yellow dust (also known as Asian Dust) blown from the deserts of China and Mongolia affects Korea, especially in spring. The dust is carried by strong winds from west to east reaching Korea, Japan and even Eastern Russia. Because of the industrial development in China in the last few decades, the winds are now carrying industrial pollutants from factories and power plants. The majority of Korean citizens therefore attribute increasing fine dust to China. Nearly 280,000 citizens signed on a petition last month asking the government to protest against the Chinese government. Their reaction is understandable. Although the Chinese government has made efforts to reduce fine dust concentration in its major cities, even more garbage incineration plants are being built in China, particularly on the east coast areas close to Korea. However, factories and plants in China are not the only culprit. Recent studies concluded that normally almost half of the fine dust originates from Korea. Thus, many environmental experts point out that it is urgent to reduce internal sources. One of the major sources of fine dust is vehicles. In the last ten years, the number of diesel cars sharply rose in South Korea because the government strongly promoted so-called ‘Clean Diesel’ and made diesel more affordable. The market share of diesel cars has been consistently increasing, making up nearly 43% of registered vehicles in 2016 (about 9.7 million cars). Some studies assert that the half of fine dust in Seoul can be attributed to diesel cars. Another main source of fine dust is coal. 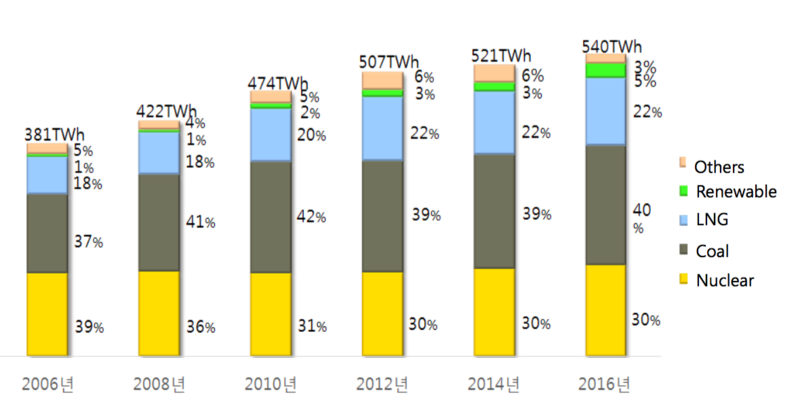 After President Moon was elected, he ordered a temporary shutdown of old coal-fired plants from March to June every year when fine dust concentration is worst. Ten coal-fired plants will be closed permanently in the coming years. However, the 8th Basic Plan for Electricity Supply and Demand announced last December affirms that power supply from coal-fired plants will increase by 2030 with seven new plants, although the share of coal will be reduced in the energy mix. More action is necessary, and the governments of China and Korea will soon be working together, establishing the Korea-China Environmental Cooperation Center this June. Some researchers suggest that a voluntary emission reduction agreement among East Asian countries could be a viable option. Those efforts will yield more fruitful results if the international community (including consumers) pushes to make industry more environment-friendly. Stricter regulation of vehicles, power plants, and factories within Korea is also essential. Proposals currently being discussed or suggested include reducing the import and production of diesel cars, running a rotation system of vehicles in downtown of Seoul, and stopping coal-fired plant construction. In the long term, the energy transition from fossil fuel to renewable energy is essential. When my Korean friends try to arrange a gathering with their children, the first thing they do is check the fine dust concentration forecast. The whole plan depends on it, because nobody wants their children to breathe in particles. It is a sad reality that many Korean kids often cannot see blue sky or play outside even on a sunny day – it’s time for this to change. Seoul is a member of the C40 group of climate-activist cities, sits on its Steering Committee, and hosted an early summit meeting of the group. But its policy seems singularly lacking in ambition. Where is the low-emission zone? Where are the electric buses and garbage trucks? Where are the tough building standards? There is a lot cities can do – if they really want to go beyond photo-ops. Ken Livingstone, the astute but sleazy left-wing Mayor of London who founded the C40, got away with the congestion charge. His measures were continued by his successor Boris Johnson, an equally cynical careerist, publicity-seeker and womaniser from the right. Now London actually has a respectable leader in the Labourite Sadiq Khan, who continues and expands their policy. There is satellite photo evidences that clearly show gas emissions from China’s factories near the coastline move up towards the Korean Peninsula. It is killing us. and something must be done about it. People in Korea can’t even breathe freely. The pollution is not from the diesel cars not from our coal plants. A few days ago, Korea’s cities recorded the worst air quality in the whole world because of this. The origin is in Chinese territory. We need to do something about it. We can’t see our blue skies. We are breathing in ashes and toxins into our system instead of fresh air we deserve. We are losing our human rights because of our neighboring country’s ignorance. This should be addressed in the UN. Next PostThe digital energy revolution? Charge it with values!